Status: Active. Assigned to Air Combat Command. 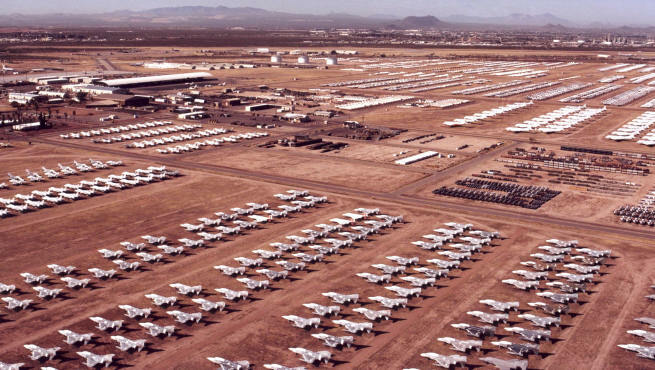 Best known as Air Force aircraft graveyard. 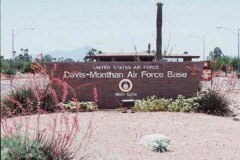 Davis-Monthan Air Force Base is a key Air Combat Command installation, located within the city limits of Tucson, Ariz., with a colorful history and a long tradition of excellence in service to our country. Although now a Tactical Air Command base, it is best known for being the graveyard of old airplanes. In the early 1960s, the 390th Strategic Missile Wing and its 18 Titan II sites were activated. This unit inactivated in 1984. In July 1963, a wing of U-2 strategic reconnaissance aircraft was assigned to the base and began flying global missions. The U-2s remained at the base until 1976, when they were transferred to Beale AFB, Calif.
Twelfth Air Force is charged with commanding, administering, and supervising tactical air forces west of the Mississippi River. As one of ACC's numbered air forces, 12th Air Force operates combat-ready forces and equipment for air superiority -- gaining and maintaining control of airspace; interdiction -- disrupting enemy lines of communication and logistics; and close air support -- working with U.S. and allied forces to defeat the enemy at the point of contact. The 305th Rescue Squadron, and Air Force Reserve unit, flies the HH-60G "Pavehawk" helicopters. Its primary mission is search and rescue. Detachment 1, 120th FIG, an Air National Guard unit, flies the F-16 "Fighting Falcon." Each week, two F-16s rotate to the base from their home base in Great Falls, Mont. These aircraft can scramble in less then five minutes to identify, intercept, and, if necessary, destroy any airborne threat to U.S. security. Other federal agencies using the base include the Federal Aviation Administration, the U.S. Customs Service Air Service Branch, the U.S. Corps of Engineers, the Federal Law Enforcement Training Center, and a detachment of the Naval Air Systems Command. Approximately 6,000 military and 1,700 civilian employees work at Davis-Monthan and nearly 13,000 military retirees reside in the Tucson area.